When you have explored Bali and feel like something new, jump on a 30 minute boat ride to one of Bali’s sister islands Nusa Lembongan and Ceningan. Clear blue water, surfing, paddle-boarding, sunsets and tranquil island vibes awaits you. Here are a few tips for your next trip. Nusa Lembongan and Ceningan are separate islands located off the South East coast of Bali. To get there you will need to take a 30 minute boat ride from Sanur Beach in Bali from one of the many boat operators. Riding a scooter/motorbike is the most common and easiest way to get around the island. You can't use cars to cross the yellow bridge that connects Nusa Lembongan and Ceningan. Bike rental will cost approximately 50.000-75.000 Rupiah per day, usually available in the harbor or ask your island stay. 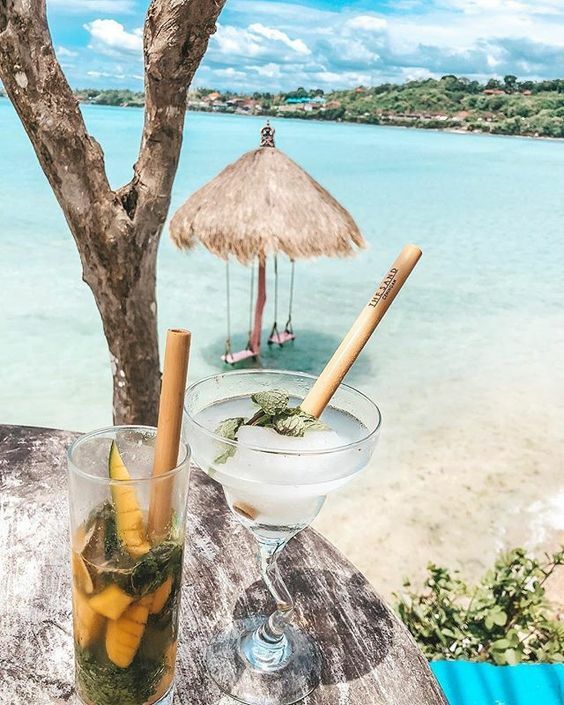 Ohana's is a boutique beach front resort that is located in the heart of Nusa Lembongan and on offer is crystal clear blue water, white sand beaches, chilled beach lounge vibes with luxury! It is an amazing place with beach lounge to hang out or just relax by the pool that overlooks the ocean. If you are looking for something unique then stay at Le Pirate, it will definitely blow your mind. It is located in Ceningan Island that is set on a prime position on a low cliff with direct beach access, overlooking turquoise waters. It is the “the box seat” to catch spectacular sunrises and incredible sunsets over the Bali volcanoes. This special little beach bar is located in Nusa Ceningan. They have swings and hammocks on the beach to relax while enjoying their amazing cocktails or smoothie bowls. Drive to the famous yellow bridge that connects Nusa Lembongan and Ceningan and visit this amazing spot to enjoy the turquoise ocean view called Blue Lagoon. Perfect Instagram holiday photos at this spot. Face your fear by trying to jump off one of the cliffs not far from Blue Lagoon. Rent a board at the deck and catch some waves at Nusa Lembongan's surf spots such as Ship wrecks and Playgrounds on the North side of the island. Under the yellow bridge you can find some local boats that will take you island hopping to the nearest island of Nusa Penida. Do not miss the beautiful beach spot called Crystal Bay, where you can snorkel and see the Manta Rays. Sandy Bay Beach Club is the perfect spot on the island to enjoy the sunset. You can have a beautiful dinner and drinks or just hang out by the pool after sunset at Sandy Bay Beach Club. It's a perfect way to end the day.